It is a privilege and an honour for me to address you as I officially assume the office today as the Secretary-General of the Convention on International Trade in Endangered Species of Wild Fauna and Flora (CITES), and to be the first woman to have been chosen to lead its Secretariat. I am grateful for the confidence shown in me by the United Nations Secretary-General to ensure that the critical work of such a long-established Convention continues to be serviced efficiently and effectively by the Secretariat. I look forward to bringing my long experience in and my passion for the conservation and sustainable use of biodiversity to the dedicated team that constitutes the Secretariat of the Convention and leading them as they support the CITES Parties. Together we have a vital mission to ensure that international trade in wild animals and plants is legal, sustainable and traceable, and does not threaten their survival in the wild. I am determined to lead a Secretariat which is accountable, transparent, impartial, fair and listens to all views from Parties, big and small, observers, stakeholders, local communities and the public at large. I intend to continue strong partnerships with others, both inside and outside the biodiversity sector, as we know the only way we can ensure the survival of all species protected under CITES is by engaging across the spectrum of actors whose actions have an impact on these species. Strong collective action across source, transit and destination States to address wildlife crime, remains essential. It is encouraging to note that the global collective effort across governments, the UN, international and national organizations, the private sector, local communities and others, to combat trafficking in wildlife, continues. 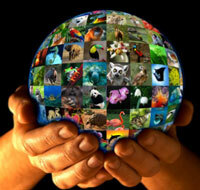 This serves to reflect the continued global determination to address wildlife crime. I am passionate about the need to support countries in their efforts towards achieving the Aichi Biodiversity Targets and the United Nations Sustainable Development Goals. We now must strengthen our collaboration with our sister biodiversity-related Conventions to set the post 2020 agenda and assess what has been achieved so far and where challenges remain. In my view, it is absolutely necessary to be able to develop actions that have a measurable impact on the status of species and be able to share best practice and lessons learned between Parties. Awareness-raising and capacity-building are clearly tasks that must continue to be supported and encouraged by the Secretariat. I intend to devote myself to finding the resources needed to support these kinds of activities at the regional and sub-regional level. I hope to engage many others, like you, to help me raise awareness about the importance of the Convention as a crucial conservation tool which ensures that only legal trade takes place and that it contributes to both species conservation and the livelihoods of those who live alongside wildlife. I am excited to join the Convention as we prepare for the 18th meeting of the Conference of the Parties that will take place in Colombo, Sri Lanka from 23rd May to 3rd June next year. I look forward to meeting you personally in the coming weeks and months and serve you all during my tenure as CITES Secretary-General.